Imagine Italy as a shapely leg whose foot is shod by a Manolo Blahnik high-heeled boot. 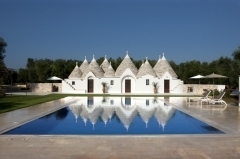 Puglia (Apulia), is Italy's elegant stiletto heel. The southern reaches of the Salentine Peninsula are virtually surrounded by the immemorial waters of the Adriatic on the east, the Ionian Sea to the south east, and the Gulf of Taranto, across which lies the Region of Calabria. In the mountainous north, Puglia is bordered, in clockwise fashion, by Basilicata, Campania, and Molise. Albania is a mere 80 kilometers (50 miles) across the Adriatic.